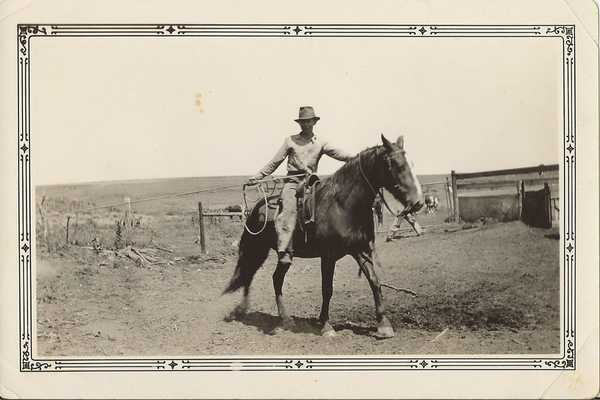 Orville Deewall working calves in Comanche County Kansas in the early to mid 1930's. Orville Deewall at the halter of The 1946 International Grand Champion Steer Royal Jupiter as he was sold in The Chicago Union Stockyards to Firestone Tire and Rubber Company. Firestone sent the steer on a 22,000 mile tour of The United States in a special van. Herb Carrier who was Assistant Herdsman at Oklahoma A&m and later AHA Fieldman in The Southeast made the trip with Royal Jupiter. June 15,2014 is not only Father's Day but is The 100th Anniversary of the birth of my Father Orville Deewall. We feel it fitting to take a moment to remember a fine cattleman and a super father. Dad grew up in Comanche County Kansas and graduated from Coldwater High School at the height of The Depression in 1932. Orville worked for his Grandfather and other area Farmers and Ranchers for 4 years. In 1936 Bruce Taylor who had been Comanche County Agent had taken a position at Oklahoma A&M College. Mr. Taylor contacted Dad and asked him if he would be interested in attending College if Oklahoma A&M would provide him a job and a place to live. Dad was willing. The job paid 15 cents an hour and the room was in The Experimental Steer Feeding Shed. Dad often remarked that he would have framed his first check but he needed the cash too badly. He progressed on to The Draft Horse Barn and finally to The Beef Barn. Orville was a member of The 1939 Livestock Judging Team and upon graduation in 1940 was hired as Purebred Beef Herdsman.Dad served in The U.S.Army from 1942 until January 1946. He returned to Oklahoma A&M and fitted both an International and an American Royal Grand Champion Steer. The American Royal Steer was a Hereford and I remember brushing him as he was on display on the main floor of The Royal Building. Orville was also a positive influence on many students who worked "at The Barn" in his 9 years as Herdsman. Another of Dad's recollections was of Sam Paylor who some of you will remember as CK Ranch Manager and before that Managed Aurthur Godfrey's Farm in Georgia. Dad said when Sam came to College his first fall he only had one pair of shoes. Sam saved his shoes to go to class and did chores barefooted and even stacked alfalfa hay in that big old hay mow barefooted until he could earn enough to buy a second pair of shoes. He wanted to get an education didn't he. Orville later managed Par-Ker Hereford Ranch in Northeast Oklahoma for 25 years. The Ranch was home to 500 cows and was a major supplier of bulls to The Commercial Industry from Kansas to Florida. I remember an Osage County Oklahoma Family buying 40 bulls privately one day before noon. I was almost always welcome to "tag along" and have valued those experiences so very much. Dad retired to Coldwater in 1978 and spent the rest of his life enjoying his family, land, and Hereford cattle. Thank You Dad for all the time you gave us. We often think Orville Deewall and Franklin Nash are looking down from above and are quite happy with The Hereford Cattle grazing the pastures of Comanche County. 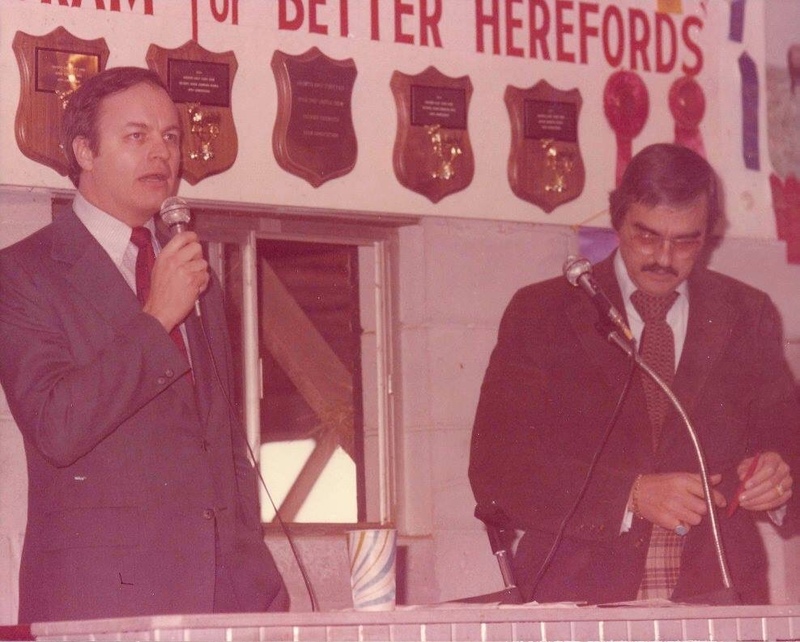 you ought to right a book on Hereford as you know it, like Orville Beyea did. stories like these are to precious to disappear. oh enjoyed the phone converation the other day. I really enjoyed reading this rich history about your father and your alls program. Very interesting read this morning. A little more Hereford History in this photo. How many people can you identify? What was the occasion and the year? Where was it? Was that taken at the Mighty Mainstream Dispersal at the Turner Ranch in early 70's maybe 72 or 73?? Hard to see but is that Bob Felton in the box, Dr. Easley in middle, with Mike Deewall second from right?? I am most likely wrong since small picture but if close others may be employees of Turner Ranch??? Now with bigger version of photo I may be right, and George Morse is in the box and was the opening auctioneer is that correct?? I read that the tempertures reached 100 degrees plus for the multi day sale. Morse is on right of Felton and is that Fred Ferrell partly obscured to Felton's left. 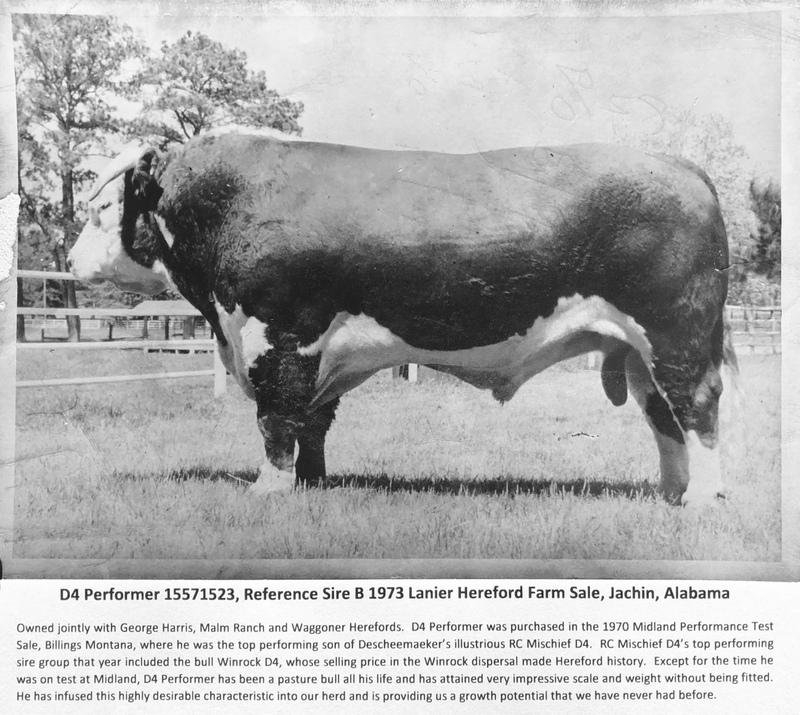 I cannot recall without looking up in old journals but 2 of men besides Doc Easley also had hereford herds maybe James Jack and another had longer last name maybe started with "S". Memory faded. You are correct on Dr. Easley, Bob Felton, Mike Deewall and George Morse. Fred Ferrell and James Jack are incorrect. The S part is correct. He had also worked for Healy's and Honey Creek and had a couple of brothers also involved in Hereford business. Also correct on the location and time frame (42 years ago today). You get bonus points for the weather report. It was very hot. Cattle took it surprisingly well. Thank You for the picture help. Appreciate it. now that was a dispersion. Left to right standing in front: Paul Stidam - Foreman - He was responsible for getting a lot of the work done on the ranch and the nearly 1,000 cows. The Stidam's were a good Hereford Family. Brother George worked for J.E. 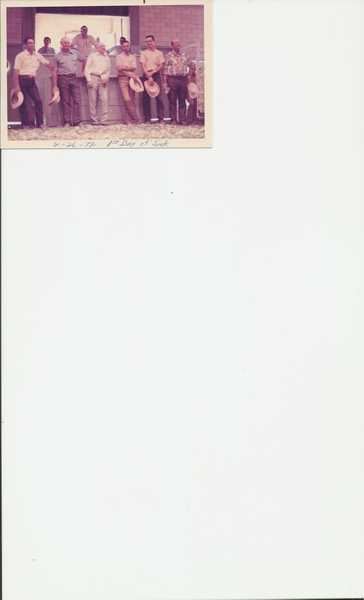 Hawkins and Hammontree Farms and Brother Jack worked for Honey Creek, Stryker and Statts Ranch. Tom Harris - In Charge of Sale Bulls. Tom was Show Cattle Herdsman in the 50's and early 60's when The Original Turner Ranch was going strong. Fitter of many Champions including Denver. Tom's Brother Paul Managed Straus Medina in Texas and later a Herd in The Southeast. Tom is one of the finest people I have ever known and now lives on his own place near Mill Creek. He thought the world of Jim McCelland and went to Lost River Ranch in Oregon with Jim in the mid 60's. Dr. G.T. Easley - Another of The Finest I have ever known. So fortunate to have spent some time in his presence. A.I. Pioneer, Excellent Veterinary, Solid Cattleman, and a truly nice person. Had a good visit with him on the phone at least once a year until his death. Barney Baker - Spent a lot of his life on Turner Ranch and could and would do about anything. He was Show Cattle Herdsman ahead of me and got tired of traveling and that made a place for me. Helped me a lot. To the best of my knowledge still in the area. Bill Horton - Farm and Maintenance Manager. He and his crew built the set up we had to run just short of 1000 lots through the ring in 3 1/2 days. We all put some ideas in it and it worked like a charm. On The Auction Block - George Morse who was "The Auctioneer" in that time period. He posessed the voice, the presence, and the eyes to read a crowd. Bob Felton - Manager - Had a very good eye for cattle and had made some "moves" with the purchase of Winrock D4, CL 1 Domino 7005, and DH Beau Mark 815 to bring The Herd back to the forefront.The cows that were there such as The HDR Real Onward 166th and The TR Zato Heir 394th daughters did their part too. Had previously managed Brookview Farms and later Lawrence Robert's and McClean Ranches. Retired in Ardmore. Ray Simms - Auctioneer - The Auctioneer Leroy VanDyke wrote the song about. I think they were cousins. They put him on The Block when they wanted to speed the sale up and we would oil the gates. He probably was not any faster than Stanley Stout but very fast in that day. Ham Hamilton and Guy Shull also Auctioneered during the 4 days. The most amazing thing about putting on that sale was how well things were organized and Paul and Tom did an excellent job with that. As a pen was sold they were driven to another location within a mile and the pen was refilled with a set of cows that would sell the next day. They kept track of where everything was and we had enough pen set ups and help to make it happen. We fed a bulky ration of mainly peanut hulls, ground hay and molasses that they could not over eat but liked well enough to stay full. Had 2 guys and a 1000 gallon water truck filling tanks as our water system could not keep up with that many cattle. The most difficult task was getting all the cattle shipped to their new owners. The only mistake I know of was a mix up on two weaned heifer calves. They were so far apart that the two new owners just traded. I know this is an ancient thread, but with all the recent information in the news about the record sized steer raised my curiosity. I worked a summer at the Hayes-Tuner ranch near Greenwood in the 70's and wanted to know if anyone had any information on the size of Winrock D4 (15563209) or a photo of the bull standing next to someone so you could get an idea for his relative size. This 1/2 brother weighed 2300lbs. I believe most of that breeding was around 3 and 4 framed, so not too big, that was just before the figured out if they doubled their size the could double their money, mmmmmm? I always thought the Winrock D4 cattle we had experience with at Winrock-Turner, OSU, and Higgins were around 5 frame . Winrock D4 himself might have been a little taller. He was framey for his time. I was told when I went to work for Winrock in June 1970 " Here is the D4 bull we bought at Midland don't show him to anyone unless the really insist." He was pretty long and tall for his time. He was tall enough to survive a 13 inch rain one night in October of 70. I got him out of knee deep water the next morning. I think I remember him weighing 23 something. He really crossed well on the HDR Real Onward 166 and the TR Zato Heir 394th females. The 394th females were good big cows. He was said to be one of the biggest Zato Heir bulls. Use to kid Dr. Easley about needing a step ladder to A.I. them. The Winrock D4 cattle would really grow and respond to feed while seeming to be efficient converters. They use to say if you went to Midland at midnight there would be some D4 cattle up eating. Compared to the other cattle we had at the time they would do more on the same amount of feed. Although we tried to give every chance we did not feed a real hot ration. They seemed to stay really sound. I just read that George Morse passed away last month at age 91. Picture of him with U.S. Senator Richard Shelby.